When the Doctor lands the TARDIS in Brighton, he hopes to see the opening of the pavilion. But he finds that he is too early so he and Romana decide to look elsewhere for their entertainment after all, they've got to occupy the thirty odd years until the pavilion opens. When they visit Madame Tissot's waxworks exhibition, they become embroiled in the strange goings on around the collection. But what does all that have to do with the head of Marie Antoinette? For the fifth series of Big Finish's popular Fourth Doctor range, there has been a strong sense of season 17. That may mean that later on this series might divide fans much like the television series 17 did as Gallery of Ghouls seems to take inspiration heavily from Life of Brian and it falls into the category of 'too funny'. In all honesty, there isn't a lot to Alan Barnes' script. There is a lot of toing and froing between waxworks, some secrets are revealed and a lot of alien tomfoolery. It is just a shame that there is never any peril alongside all the comedy involved. But by no means is this a story to skip over. Don't go into Gallery of Ghouls expecting apocalyptic aliens or time travel stuff. It does feel quite refreshing not to find The Doctor and Romana embroiled in invasion attempts by apocalyptic aliens. So, enjoy this for what it is, a chance to hear The Fourth Doctor and Romana back again! 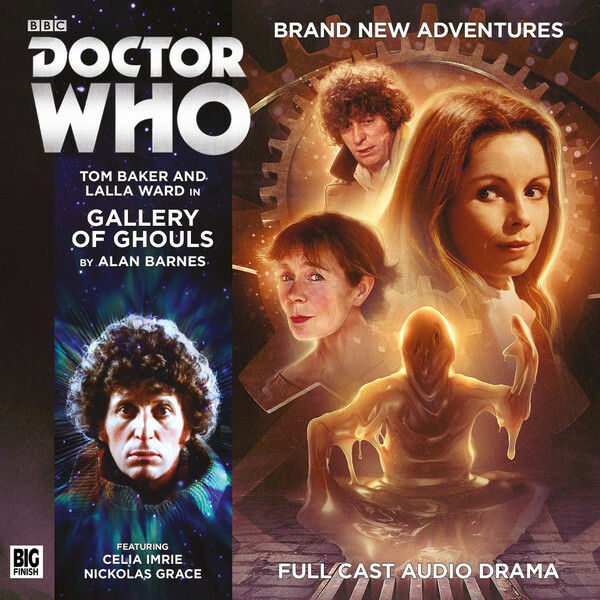 GALLERY OF GHOULS, WRITTEN BY ALAN BARNES AND STARRING TOM BAKER AND LALLA WARD WAS RELEASED BY BIG FINISH PRODUCTIONS IN MAY 2016.